Thus we have the promise of Jesus Christ that His Church would be “indefectible,” carrying out Its mission of teaching His truth until the end of time. And, in the same breath, we hear that an essential element of that longevity would be Peter and those who followed in his footsteps—his successors as bishops of Rome, the Popes. With the death of Pope John Paul II we have had something of the order of 265 Popes—there are a few pontificates about which historians disagree as to who the legitimate Popes were, but the number is probably close, if not exact. That list includes men who were holy, as well as sinners—some saints and some down right scoundrels. It includes men of great intellect and political influence, as well as a number who were very humble and retiring. It includes a significant number of men who gave up their life’s blood in martyrdom for Jesus Christ. In the early years of the Church the papal life expectancy was quite short—an average of about eight years—in sharp contrast to the thirty-odd year reign of Blessed Pius IX at the end of the 19th century, or to the 27 years of our recently deceased Pope John Paul II in the beginning of the 21st century. Popes die, but the Church continues on. As with the death of any Catholic, the Church’s concern is with the eternal repose of the deceased Pope’s soul. Perhaps the news media have been well intentioned, but they have distorted this important part of the Church’s process of mourning—Catholics do not eulogize their dead; we pray for their eternal salvation. The current law of the Church issued by Pope John Paul, himself, in 1996, forbids audio recording, photographs or filming of the dying or dead Pope for all but archival purposes. We are forbidden to make the rash assumption that a deceased loved one is in heaven; in strict justice we are required to pray for the souls of those close to us—our parents, family, and friends—and á fortiori, we are required to pray for the man who was the universal father of Christendom (which is precisely what the name “Papa-Pope” means.) I thank all of you who assisted at the Requiem Mass and the Office of the Dead that we offered for the Pope’s salvation. Were any one of us in this church to die, the Church prescribes that a Mass is an essential part of our funeral—usually a Requiem if the liturgical calendar permits. Our friends and family may offer additional Masses for us, but only the one is prescribed by the Church Itself. But for the Pope, the Church observes the tradition of the “Novendiale”; a novena of nine Masses offered for the repose of the soul of the Pope. According to Catholic tradition, the Pope lies in state in Saint Peter’s basilica—vested in pontifical vestments; the penitential purple and the plain white miter. Even the scarlet robes of the Cardinals are put aside in favor of the purple they would wear during Lent. Throughout the Catholic world, during those nine days, priests add a special set of collects to the prayers of their Masses—if your Latin is good, you have noticed me reciting them. The first of the prayers is on the window of the church on the poster announcing the Pope’s death—you can find all three in your missal, and you might recite them with the Church, for the Novendiale has a couple more days yet to run. Not terribly long after the conclusion of the Novendiale the Cardinals will enter the solemn Conclave which will elect the next Pope. In recent years (1970) Pope Paul VI restricted the eligibility to vote to those Cardinals under the age of eighty. The residence of the Cardinals, the Domus Sanctæ Marthæ, and the Sistine Chapel will be sealed off from outside entry, and communications with the outside will be restricted to those absolutely necessary. The Cardinals will take an oath to vote for the man they deem most appropriate to lead the Church as Supreme Pontiff; to serve faithfully if elected, preserving the patrimony of the faith; to accept the outcome of the Conclave as binding; and to preserve secrecy as to the deliberations of the Conclave. After each scrutiny the ballots are burned with damp straw if no Pope has been elected. 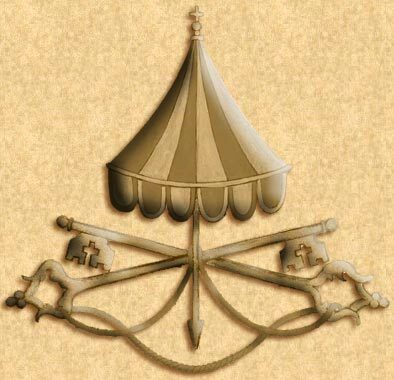 The damp straw is intended to produce black smoke which is visible to those waiting outside, informing them that the Cardinals have been at work, but that no Pope has been elected. Only white smoke will symbolize the election of a new Pope. This system has been known to “mis-fire” a few times—the black smoke sometimes looks pretty white—so the plan now is to ring the bells of Saint Peters along with the white smoke. When a man received a number of votes adequate to his election, he is first asked whether or not he accepts the election. His consent is imperative, and if he refuses, the balloting must begin anew. If he does accept election, he will then be asked what name he will be called as Pope—for a long time Popes have taken a new name; generally that of an esteemed predecessor. A document of acceptance will be drawn up for the new Pope’s signature. If he is not already a bishop, he will be consecrated “immediately” – only they will he receive the “homage and obedience” of the Cardinals, and his election will be announced. The new rules contemplate a “ceremony of inauguration” rather than the traditional coronation as Pope. He then is led to the Lateran Basilica, the cathedral of the Popes, where he takes canonical possession. The last Pope to be crowned with the tiara was Paul VI—with John Paul I opting for a more simple ceremony of inauguration. Before I conclude, I am going to ask two things of you: First, continue to pray for the repose of the soul of Pope John Paul II, at least until the nine days of the Novendiale run out on Tuesday, or perhaps a while longer. Second, please pray for the election of a good and holy man to lead the Church as his successor. The Conclave will not begin until April 18th, but beginning on Tuesday we will begin to pray the Collects praying to God for the election of an excellent successor. There is a special Mass for that intention, and I hope that many of you will join me in offering it on Tuesday morning (April 12).